Founded over a thousand years ago, the kingdom of Cormyr benefits from an enlightened monarchy, hard-working citizens, and an advantageous location. Cormyr is a civilized land surrounded by mountains, forests, and settlements of evil humanoids. Known for its well-trained military and its active group of government-sanctioned spell-casters, Cormyr boasts fine food, honest people, strange mysteries, and abundant contacts with other parts of the world. 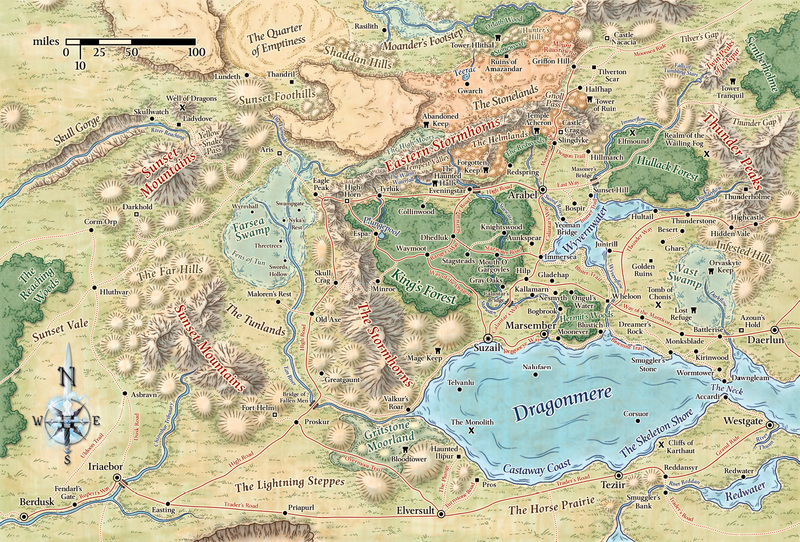 Recently challenged by treacherous noble families, armies of goblins and orcs, famine, a marauding ancient red dragon, and the death of its beloved monarch, Cormyr is now struggling to maintain its holdings. With one of its cities in ruins and great numbers of evil humanoids still roaming the countryside, this nation is in need of resourceful individuals willing to defend the crown and confront its enemies. Though there are strong reasons why it shouldn't be, Cormyr is a steadfast and prosperous land. Despite an often-violent past, constant armed vigilance against beasts and border perils, and frequent treasonous intrigues, Cormyrians remain loyal, content, prosperous, and peace-loving folk. While the serious reverses of the last two years have shaken the kingdom, Cormyrians expect better days ahead and are willing to work to achieve that goal. The Obarskyr family rules Cormyr, assisted by wise Royal Mages. The long reign of Azoun IV, aided by former Royal Magician Vangerdahast, gave the realm a legacy of stability and prosperity that's the envy of much of Faerûn. Beneath the royal family is a wealthy, sophisticated, often fractious group of noble families of long lineage, influence, and demonstrated loyalty to the crown. The War Wizards - a force of battle-mages under the command of thoughtful wizards such as Caladnei - temper both royal and noble excesses. As the sage Bradaskras of Suzail put it, the Obarskyrs, the nobility, and the War Wizards "form three legs of a stool on which the common folk sit." Most Cormyrians are farmers, ranchers, horse-breeders, foresters, or craftsfolk. The country also maintains a large, capable army, the Purple Dragons - not to be confused with Azoun IV, the king who was called the Purple Dragon, or the Purple Dragon Thauglor, long the largest and mightiest wyrm of the Dragon Reach. The Forest Kingdom is a rolling, green, and pleasant land, flanked by mountains and well fed by its own farms and ranches. Old, deep, and lush forests dominate the landscape and national character. The dragon, the stag, and the unicorn characterize the land in Cormyrian folk tales, ballads, and heraldry: The wyrm represents the land's old, never-quite-tamed wildness; the stag stands for royal (and noble and wealthy) sport, plus the bounty of the land for all; and the unicorn symbolizes the hidden mysteries and serenity at the heart of the forests and the shelter those green fastnesses have always offered Cormyrians in peril. Even the nation's kings took advantage of this shelter in the realm's darkest days. Farsea Marshes: A fallen civilization that predated the elves rests in this ugly marsh. Its only remnants are ornate buildings made of glass as strong as steel. Those who have seen these structures seldom live long, however, for the swamp is thick with pestilence and plague. The ruins hold gold and strange creatures, which draw adventurers despite the dangers. Hullack Forest Once a part of the forest of Cormanthor, the Hullack used to define the eastern border of Cormyr. Over the prosperous reign of Azoun IV, people heavily settled the forest verge and cut it back substantially. The Hullack is the most primeval forest in Cormyr, with dark valleys and hidden vales that have gone unseen for decades. Ghostly creatures and odd monsters pepper the local folklore, and orcs and goblins are frequent visitors from the Thunder Peaks. Cormyrian wardens often direct adventurers to the Hullack in the hope of taming this wood. King's Forest: This is the westernmost fragment of Cormanthor, long abandoned by the elves to humankind. With little undergrowth, a wealth of wildlife, and a high canopy, the King's Forest is entirely the property of the crown and used to be a pleasant place to ride. Now, however, it is inhabited by the orcs who were driven from Arabel. The King's Forest contains no known ruins and fell creatures had never been known to lair here until the orcs moved in. Marsh of Tun: Sister to the Farsea Marshes, the Marsh of Tun holds a similar ancient civilization. Old stories say that the two city-states quarreled and unleashed foul magic upon each other, both on the advice of an old woman who may have been an agent or manifestation of an evil deity. Bands of humans who raid caravans leaving Cormyr live in the portions of the swamp not tainted by sickness, under the rule of bandit lord Thaalim Torchtower (LE male human Ftr10). Stonelands: A band of wide, rocky desolation between the Storm Horns and Anauroch, this region is inhabited by small groups of military-minded goblins, gnolls, orcs, and evil humans, all of which are referred to as "border raiders." For decades, Cormyr's rulers have offered generous land grants to adventurers willing to tame these lands and carve out human holdings. The Zhentarim, on the other hand, actively marshal the goblin bands as raiders, but have had only erratic success in recruiting them. Storm Horns: These forbidding mountains are massive and sharp, forming a high wall broken only near High Horn Pass and Gnoll Pass, which are guarded by Castle High Horn and Castle Crag. The Storm Horns protect Cormyr from attack but also limit expansion to the north and west. Although humanoid tribes live in the mountains, their power was broken long ago. They pose a threat only when a shaman or charismatic barbarian manages to pull them together for raids. Some of the tribes are learning to trade peacefully, exchanging iron ore and furs for food and gold. Other tribes deeper within the Storm Horns resent the flatlanders and prepare ambushes for explorers. A number of orc survivors from the attack on Arabel have fled to the eastern Storm Horns, and many roam the flatland between the mountains and the city. The mountains are also home to rogue dragons, which often wake up, hungry after resting from their last great flight. The Storm Horns have two permanent human settlements. Eagle Peak (hamlet, 153) is built on a large outcropping. and is a popular caravan stop, while Skull Crag (hamlet, 270) is a mining community overshadowed by a large rock dedicated as a shrine to Kelemvor. Thunder Peaks: Named for the sudden and devastating storms that batter them all year, these wild and unsettled mountains are home to tribes of orcs and goblins that bear no love for Cormyr, Sembia, or the Dales. The humanoids raid settlements constantly despite Cormyrian patrols, and travelers are advised to go armed and wary. The mountain passes are blocked in the winter by snow. The inclement weather makes large-scale mining operations difficult, although solitary prospectors some times return with silver nuggets the size of fists. Many never return at all, however, having encountered Aurgloroasa the Sibilant Shade, a dracolich that lairs in the abandoned dwarven city of Thunderholme. Vast Swamp: This region of marsh forms the border between Cormyr and Sembia, as neither country wishes to claim it and both disregard the area unless its monsters wander into their territories. Home to gnolls, hobgoblins, lizardfolk, and trolls, the swamp is also known to shelter a few small black dragons, a mad beholder or two, will-o'-wisps, and stranger things. This is probably the deadliest region within the country, but since the creatures usually remain in the swamp and the people of Cormyr have no reason to enter it, they are content to ignore it. Wyvernwater: This clean, clear, star-shaped lake produce. abundant fish, crabs, and eels every year. In the morning the water is conveyed in a thick fog, and fisherfolk who rise early to fish the lake are known as mistfishers. Connected to the Dragonmere by the Wyvernflow River, the Wyvernwater provides access to the Sea of Fallen Stars. Cormyr has become a land of chivalrous knights, fractious nobles, and wealthy and verdant farms. Its freedom-loving, often independent citizens are proud to live under the Purple-Dragon banner - but they remain quick to complain about injustice, corruption, and decadence. Arabel (Metropolis, 30,606): During the goblin war, Arabel was evacuated to Suzail with the help of magic, and the city was occupied for several months by an army of orcs and goblins. The trading company outposts were looted, the mercenary groups that. were not slain fell back to other cities, and the great temple to Tymora was burned (as were the shrines to Chauntea, Deneir, Helm, Luira, Tempus, and Waukeen) Arabel's lord, Myrmeen Lhal (NG female human Rgrl2 of Tymora), known as the Lady Lord, swore to reclaim her city. Despite the loss of her left arm and its subsequent restoration by powerful magic, she spent the last few months collecting mercenaries, rangers, scouts, and adventuring bands for that purpose, then forced the orcs from the city. The orcs fled to the Hullack, King's Forest, eastern Storm Horns, and the plains to the north of Arabel. While routing the humanoids from the open farmlands may go easily, clearing the forests of their presence will be far more difficult. Castle Crag: Built to defend Cormyr's northern border against dangers from the Stonelands, Castle Crag houses five hundred Purple Dragons and a detachment of five War Wizards. The stiff-necked commander Bren Tallsword (LN male human Ftr1O) calls for frequent drills and inspections. Adventurers are not welcome here; those who arrive are sent on their way as quickly as possible. Dhedluk (Small Town, 936): This community in the King's Forest is home to farmers and woodcarvers; cutting live wood has been forbidden for several years. Surrounded by a stockade, the village is now threatened by the orc raiders driven out of Arabel. Dhedluk's lord Thiombar CNG male human Ftr5) has a talent for reading people and a reputation for knowing everyone in Cormyr. A two-way portal on the outskirts of town connects to a spot near the entrance to the Royal Court in Suzail. Eveningstar (Small Town, 974): Eveningstar is a crossroads settlement. It serves the nearby farms, a small number of craftsfolk who rely on the farmers' goods, and the adventurers who travel this way. Lord Tessaril Winter (CG female human Wizl2/Ftr6) is a quick and efficient ruler. The village maintains a temple to Lathander but is mainly known for its proximity to many ruins, notably the Haunted Halls of Eveningstar. The winged cats known as tressym are common in this area, making Eveningstar a popular place for anyone who would have one as a familiar (as Tessaril does. A portal created by cleric of Mielikki connects a blueleaf tree here with another in the royal gardens of Suzail. The quiet pace of life here was interrupted by Myrmeen Lhal, who used the city as a mustering-point in her battle to reclaim Arabel, and the place has had to fend off occasional orc raids ever since. Immersea (Small Town, 1,170): This community is home Wyvernspur and Thundersword noble families, who inhabit several of the manors on the southwest end of town. Visitors are warned to respect anyone dressed in finery or displaying arrogance, since the families are powerful and not afraid of proving it. Immersea is a stop on the trade road. Its Five Fine Fish inn produces ale famous throughout Cormyr. There are no temples here, but a large open-air shrine to Selûne is maintained by a cleric of that faith. The lord of Immersea is Culspiir (LN male human Rog3), former herald of the previous lord. Marsember (Metropolis, 36,007): The second-largest city in Cormyr, Marsember is a seaport constructed on a series of islands connected by bridges and cut with canals. Originally built on a swamp, Marsember grew to include nearby terrain, but it still often smells like a marsh. Known as the City of Spices for the local trading companies that procure those goods from far nations, the city relies on trade. Small boats crowd the canals, and many dealings are done in secret to avoid the law. Flat, hard ground is hard to find here, and only the wealthy can afford large paved areas, usually on top of buildings. Marsember's single large temple is to Lathander, though it also has small shrines to Tymora, Umberlee, and Waukeen. Bledryn Scoril (LG human Ftr9) has taken over as lord of the city since the untimely demise of the previous lord. A twelve-ship detachment of the imperial navy is stationed here. Suzail (Metropolis, 47,009): The royal capital and richest Cormyr, Suzail is home to the important nobles and merchant houses of the country. The center of the city is the royal palace which is surrounded by gardens and the buildings of the Royal Court. The city maintains a large barracks for the Purple Dragon, plus stockyards, shipyards, and dozens of inns, taverns, and festhalls. Tymora's is the most prominent temple, though shrines to Lliira, Oghma, Malar, Milil, Tempus, and Waukeen are also found here. The famous ivory carvers of Suzail buy exotic ivory from many lands, shape it into new and decorated forms, and export it at a greatly increased value. The lord of the city is Sthavar (LG male human Ftr10/Prp5) confident and loyal man who also commands the Purple Dragons. The presence of the Purple Dragons and War Wizards has been more visible since the death of Azoun, as the Princess Regent wishes to assure the common people of their safety and simultaneously be prepared for riots or rebellious activities instigated by contrary nobles. She makes regular appearances with the heir in order to or make herself available to the people and to show that she is not afraid for her life or for Cormyr's future. Tilverton (formerly Small City, 9,002; now empty): This city was occupied for many years and was formally absorbed into the nation of Cormyr last year. Once a valuable piece of territory overlooking one of the three passes through the Thunder Peaks, Tilverton suffered an attack of unknown origin in Mirtul of 1372 DR. Now all that is left is a dark, concave space filled with shadows and flitting regions of deeper darkness. A force of fifty Purple Dragons has been stationed nearby to ward off visitors, for those who enter the area become dim and eventually vanish, never to return. A triad of wizards from Waterdeep has been studying the site from a distance, but so far has reported only that a great deal of powerful magic has been used in the area. It has caused a disruption in the Weave to such an extent that it greatly limits their ability to investigate further. A dirt road has been cleared around the strange ruin to allow caravan traffic passing through the area. Waymoot (Small Town, 1,980): Waymoot was built in a five-mile-diameter artificial clearing inside the King's Forest. The town has a large keep, but because of the general safety of this forest, the outlying buildings are not protected by the walls. A trader's town, Waymoot breeds quality horses and creates and repairs wagons. Its lord is Filfar "Trollkiller" Woodband (LG male human Ftr1O), a very strong man somewhat uncomfortable with his well-deserved title (gained when he helped repel a troll attack when he was younger). The town has a small temple to Tymora and one to Lliira. Wheloon (Small City, 6,661): Known for its vibrant green slate roofs, Wheloon grew up around the ferry traffic on the Wyvern flow river. The roofs color is derived from the stone of a large and monster-haunted quarry due north of the town. Most of the locals are craftsfolk, making boats, baskets, sails, and pottery. Their lord is Sarp Redbeard (NG male human Ftr9), a head strong man who disagrees with court policy on many matters and is liked by the locals for his attitude, which they suspect keeps the Purple Dragons out of their daily lives. The town has a temple to Chauntea and a shrine to Silvanus. In ancient times, the Forest Country between the Thunder Peaks and Storm Horns mountain ranges was the domain of dragons, including "the" Purple Dragon, the mighty wyrm Thauglorimorgorus. Elves who settled here found themselves at war with the dragons. This ongoing strife ended in a Feint of Honor duel in which the elf Iliphar Nelnueve, Lord of Scepters, defeated Thauglor. Even as the elves displaced the dragons, humans from Impiltur and Chondath eventually pushed back the elves from the coast of the future Cormyr. As strife between elves and humans grew and humans cleared forests to establish farms, the wisest elves saw that they could not stop or defeat the human intruders. Judging the settler Ondeth Obarskyr to be the most influential human leader, they selected the human wizard Baerauble Etharr (consort to the elf Alea Dahast) to be their agent in guiding Ondeth. In this way the elves hoped to slow settlement, keep peace, and retain the best stretches of forest Ondeth's farm ultimately grew into the great city of Suzail, named for Ondeth's wife Suzara. Ironically, she hated Cormyr and the frontier life so much that she eventually left him. Ondeth was a just and honorable man, and although Baerauble was reluctant to leave elven society, he became the first of the famous guiding Royal Magicians of Cormyr. When Ondeth died, the elves convinced his son Faerlthann to become the first king of the human realm they'd shaped and so, in the Year of Opening Doors (26 DR), Cormyr was founded. Through the efforts of Baerauble and his successors, as well as the vigor and wits of Cormyr's royal family, the throne has been held by the Obarskyrs for over a thousand years. During that time, the Forest Kingdom has grown prosperous and strong, survived several invasions, absorbed the realms of Esparin and Orva, claimed the still-wild Stonelands, and crushed repeated rebellions in the cities of Arabel and Marsember. Despite several challenges to the throne and internal uprisings, the Obarskyrs have remained in control of Cormyr, assisted and directed by wise and forward-looking wizards. Cormyr reached its zenith under the rule of King Azoun IV, who was crowned in 1336 DR. Years of prosperity under his capable rule, bolstered by the wisdom of the Royal Magician Vangerdahast, made Cormyr stronger. Its might and influence waxed, its population grew, and Cormyrians became successful merchants and shopkeepers, each generation achieving more wealth and learning than the last. During Azoun's time the westernmost marches were settled in earnest, Sembia was rebuffed in border disputes, forays were mounted against the growing Zhentarim power in the Stonelands, Tilverton was occupied as a protectorate, and overtures of lasting alliance were made to the Dales. Though never a match for the glittering wealth of neighboring Sembia, Cormyr was widely envied for its strength and security. Cormyr's peace finally failed in the last two years of Azoun's reign. A blight fell upon the land, orcs and goblins invaded in numbers not seen in Cormyr for centuries, and old foes of the Obarskyrs, risen through evil magic as ghazneths (magic draining winged creatures of great power), tore at the realm. Cormyr roused itself to war, only to suffer defeat after defeat. Goblin castles arose in the northern reaches, Vangerdahast disappeared, and the ghazneths were joined in the skies by a huge wyrm, the "Devil Dragon," Nalavarauthatoryl the Red. Azoun and his warlike younger daughter, Alusair the Steel Princess, fought the goblinkin but tasted more defeat. The city of Arabel was besieged, evacuated, and lost to goblin armies. Some nobles committed outright treason, and others openly defied the Crown Princess, revealing that many among Cormyr's nobility no longer felt any loyalty to the crown beyond their personal respect for Azoun. By the end of the crisis, the Devil Dragon and Azoun IV had slain each other on the battlefield, and a great number of the realm's mightiest warriors, officials, soldiers, War Wizards, and highest nobility were lost. Crown Princess Tanalasta defeated the ghazneths but, died soon after in childbirth giving the land a new king: the infant Azoun V.
Today Princess Alusair rules Cormyr as regent, ably assisted by the Dowager Queen Filfaeril. The ailing wizard Vangerdahast has chosen a successor, the battle-sorcerer Caladnei, and hidden himself away from the eyes of the world. Many nobles are on the sword's edge of rebellion, others seek to claw their way back from exile, and Sembian interests are trying to covertly take control of Cormyr or at least gain substantial influence. As the land rebuilds, it offers new opportunities-and new dangers. The Regent has more to do than resources to do it with. Alusair has always been favorably inclined toward fellow adventurers, and she is turning again to bold companies and freebooting bands of heroes to help her restore order to the land. Unfortunately, some of Cormyr's high nobles perceive this as yet another sign of weakness in Suzail. Baron of the Stoneland: Now that the Zhentarim control the Moonsea area, they are again turning their eyes to the southwest, hoping to enter Cormyr through the Stonelands. King Azoun maintained a standing offer to grant the title of Baron of the Stonelands to any claimant who dwelled there, built a castle, and policed the area. Alusair honors this policy, so a clever and powerful adventurer could take advantage of this offer, clearing the area of monsters, bandits, and Zhentarim agents. Once titled, the character could establish a stronghold and ensure noble titles and a permanent place in Cormyr's history. The Quiet War: With the disruptions to the lands of the nobles and the royal house, and Sembia looming aggressively on the horizon, intrigue is in season among the nobles of Cormyr. The houses try to win new lands, influence, titles, and positions at court by choosing their words carefully and backing the popular factions. Sembia takes advantage of its merchant power, exiled nobles try to force their way back into politics, rising families pressure Alusair, and the War Wizards argue for spying on every noble house hold to prevent treason. Adventurers can support or thwart any of the factions and may be rewarded for their efforts and fealty with titles and plots of land.